Villa feet in the water at the unique situation, overlooking the beach of Escalet and the sea. Furnished with great taste, for 6 people, 100 m2 on 1000 m2 (10 acres) of land with vegetation and provencal tower. 2 terraces, one shaded. spa. barbecue. parking 3 cars. 3 rooms. Balinese daybed. Comfort side the villa has all the necessary appliances, air conditioning in all rooms, alarm, safe, barbecue area will be at your disposal. It seems that nothing can be faulted, as the decoration, retail research and the meticulous care taken in the implementation of high-quality materials make it a unique property. The price includes all charges, except final cleaning, linen rental and pool heating outside of high season. My wife, son and I visited this lovely L'escalet vacation villa the last two weeks of July, 2011 and it was perfect. A truly beautiful location with all of the amenities you need for a relaxing vacation. Everyday the view of the sea was different - we even enjoyed a rainbow which stretched from Cap Taillat to Pampelonne! The caretaker and his daughter are lovely and were most helpful with questions we had about how to operate the security system, television, spa and air conditioning. The beach was filled with families, offered great snorkeling, and the wonderful hike toward the Cap allowed us to work of some of the wonderful food and rose we enjoyed. Mdme. Maurain was fantastic with her communication and she thinks of everything you could ever require. We cannot wait to return again next Summer! The property is located in L'Escalet right on the beach with nice views over the bay. 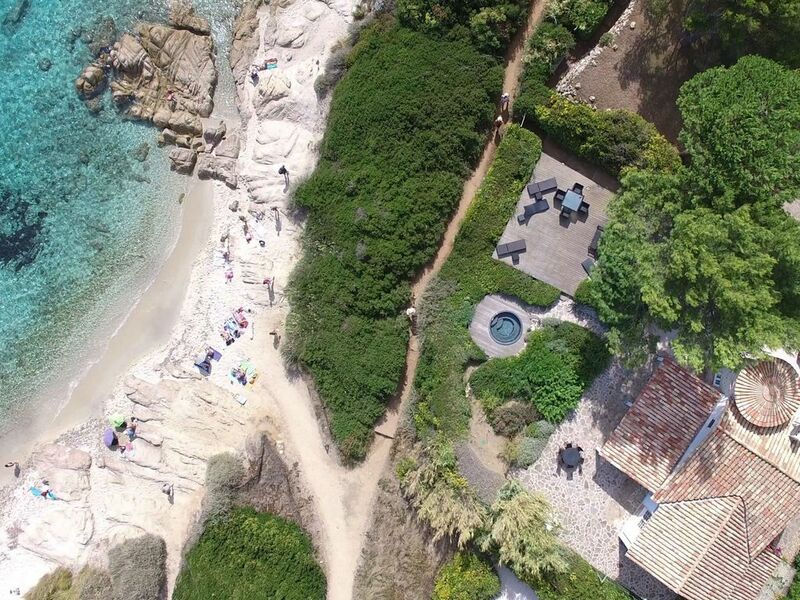 A small footpath takes you from the house right to the beach in less than 1 minute, so that you can lay in the sun in the lovely garden of the house and do not need to use the sometimes crowded beach. The house itself is very lovely decorated and equipped with all amenties - really nothing is missing. In addition the house and garden are very well maintained - much better than most of the holiday homes we have rented in the past. The owner is very kind and reliable. We can fully recommend this place and hope to stay there again in the future. Wir haben soeben eine Woche in dem Haus direkt am Meer verbringen dürfen. Das Wetter hat leider nicht mitgespielt, sodass wir den Garten nicht so geniessen konnen, wie es eigentlich sein könnte. Das Haus ist perfekt gelegen, ca. 5 - 10 Minuten von Ramatuelle und etwas mehr wie 10 Minuten von Gassin oder St. Tropez entfernt. Es liegt direkt am Meer - hat zwar keinen Pool, aber wer braucht den schon, wenn gleich darunter ein kleiner Strand zum banden einlädt. Dieser Platz ist etwas für Ruhe Suchende, die auch gerne mal wandern gehen, was man direkt vom Haus aus über die Klippen wunderbar tun kann - stundenland, wenn man mag. Unserem Hund hat das, trotz Regen sehr gefallen. Ein ideales Haus für Familie oder ein paar Freunde, die gerne mal zu Hause sind und Barbecue machen, sich unterhalten und und. Das innere des Hauses ist mit allem ausgestattet, was man im Urlaub so braucht. Uns hat es gefallen und wir kommen bestimmt wieder. Je peut vraiment seulement la recommander! Im Mai 2011 haben wir Urlaub in diesem traumhaft gelegenen Haus verbracht. Die Lage des Hauses direkt am Strand ist nicht zu übertreffen. Auf dem abgeschlossenen Grundstück mit seinen verschiedenen Terrassen findet man zu jeder Tageszeit einen Sonnen,- oder Schattenplatz. Besonders der große Whirlpool hat uns begeistert. Das Haus war hervorragend ausgestattet und wir haben uns rundum wohlgefühlt. Hervorzuheben ist auch die Betreuung vor Ort. Nous y avons passé une semaine en juin dernier. L'endroit est vraiment magnifique, presque mieux que sur les photos. La maison est très bien équipée, surtout la cuisine, entièrement refaite. Profiter 24 heures sur 24 heures à 20 mètres de la mer avec cette vue paradisiaque, c'est le ressourcement et dépaysement total. En plus, c'était un plaisir de faire la connaissance de la propriétaire, toujours à notre écoute, et la personne sur place s'est très bien occupé de nous. On y retournera !